Akhila went to a fair in her village. She wanted to enjoy rides on the Giant Wheel and play Hoopla (a game in which you throw a rig on the items kept in the stall, and if the ring covers any object completely you get it). The number of times she played Hoopla is half the number of rides she had on the Giant Wheel. Each ride costs Rs 3, and a game of Hoopla costs Rs 4. 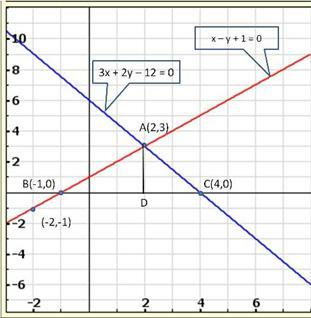 If she spent Rs 20 in the fair, represent this situation algebraically and graphically. Aftab tells his daughter, "Seven years ago, I was seven times as old as you were then. Also, three years from now, I shall be three times as old as you will be." (Isn' this interesting?) Represent this situation algebraically and graphically. Let the cost of 1 kg of apples and 1 kg grapes be Rsx and Rsy. Concept insight: cost of apples and grapes needs to be found so the cost of 1 kg apples and 1 kg grapes will be taken as the variables. From the given conditions of collective cost of apples and grapes, a pair of linear equations in two variables will be obtained. 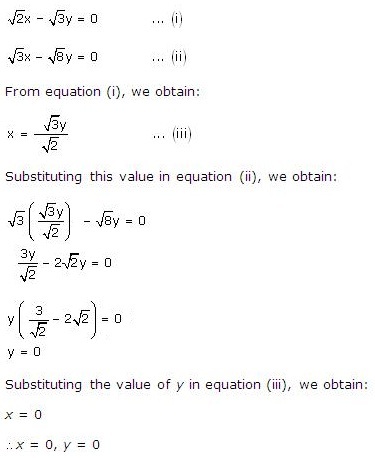 Then, in order to represent the obtained equations graphically, take the values of variables as whole numbers only. Since these values are large so take the suitable scale. 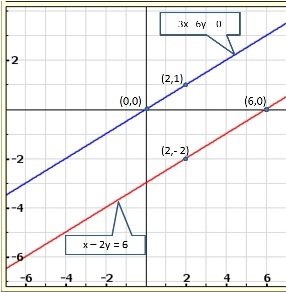 Since, the graph of the two lines coincide, the given system of equations have infinitely many solutions. 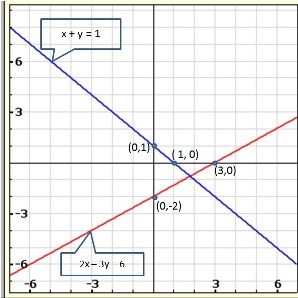 Solve graphically each of the following systems of linear equations. 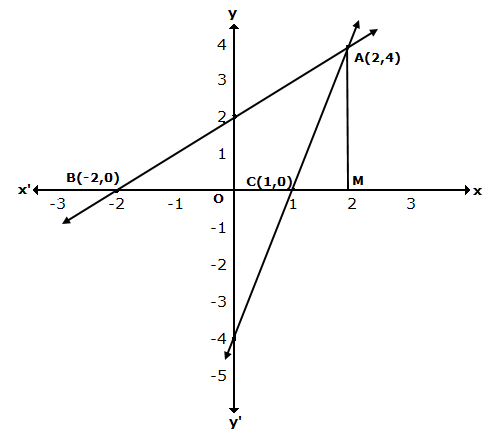 Also find the coordinates of the points where the lines meet axis of y. 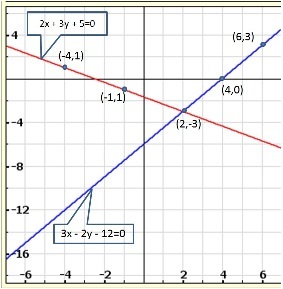 Draw the graphs of the equations 5x - y = 5 and 3x - y = 3. 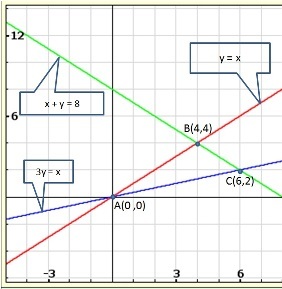 Determine the co-ordinates of the vertices of the triangle formed by these lines and the y axis. Calculate the area of the triangle so formed. (iii) Champa went to a 'Sale' to purchase some pants and skirts. When her friends asked her how many of each she had bought, she answered, "The number of skirts is two less than twice the number of pants purchased. Also, the number of skirts is four less than four times the number of pants purchased". Help her friends to find how many pants and skirts Champa a bought. 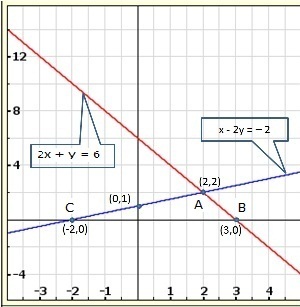 Let us draw the graphs of Equations (1) and (2) by finding two solutions for each of the equations. The two lines intersect at the point (1,0). 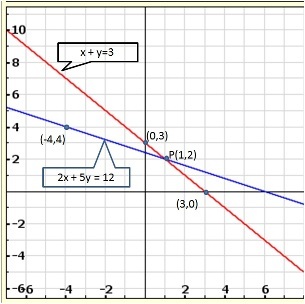 So, x = 1, y = 0 is the required solution of the pair of linear equations, i.e., the number of pants she purchased is 1 and she did not buy any skirt. 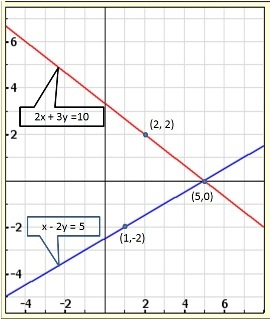 Find the ratio of the areas of the two triangles formed by the lines representing these equations with the x-axis and the lines with the y-axis. 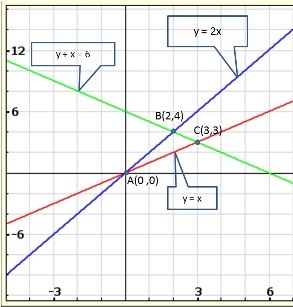 The lines AB and CD intersect at point R(1, 4). 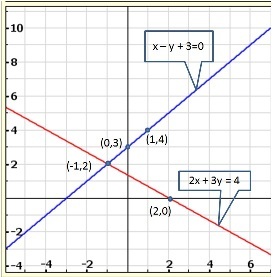 Hence, the solution of the given pair of linear equations is x = 1, y = 4. 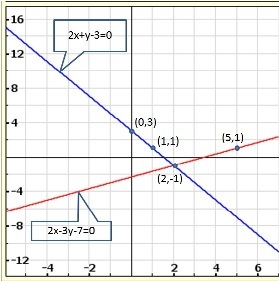 From R, draw RM ⊥ X-axis and RN ⊥ Y-axis. 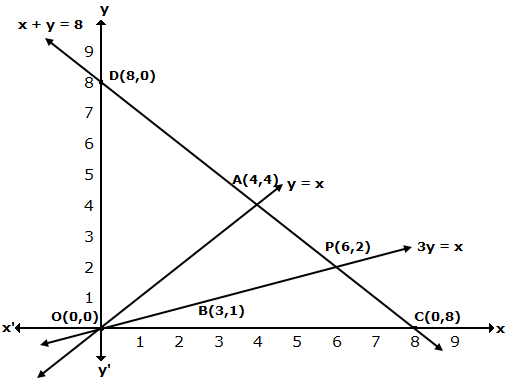 Determine, graphically, the vertices of the triangle formed by the lines y = x, 3y = x, x + y = 8. 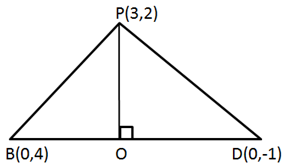 From the graph, the vertices of the triangle AOP formed by the given lines are A(4, 4), O(0, 0) and P(6, 2). 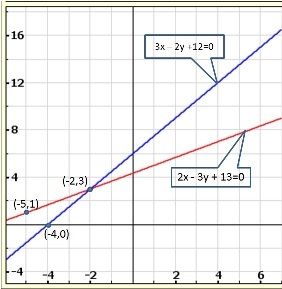 Draw the graph of the equations x = 3, x = 5 and 2x - y - 4 = 0. 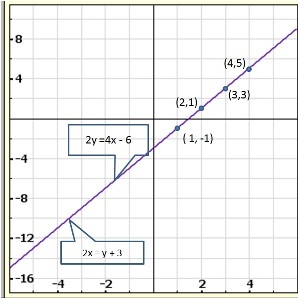 Also, find the area of the quadrilateral formed by the lines and the x-axis. 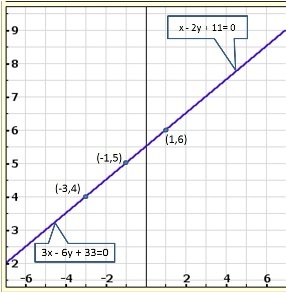 The graph of x = 3 is a straight line parallel to Y-axis at a distance of 3 units to the right of Y-axis. 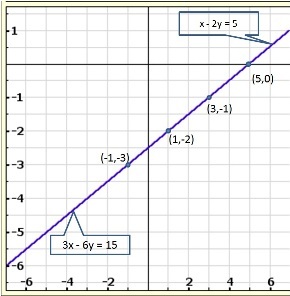 The graph of x = 5 is a straight line parallel to Y-axis at a distance of 5 units to the right of Y-axis. 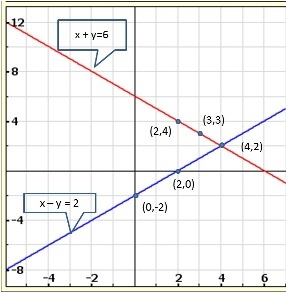 Draw the graphs of the lines x = -2, and y = 3. 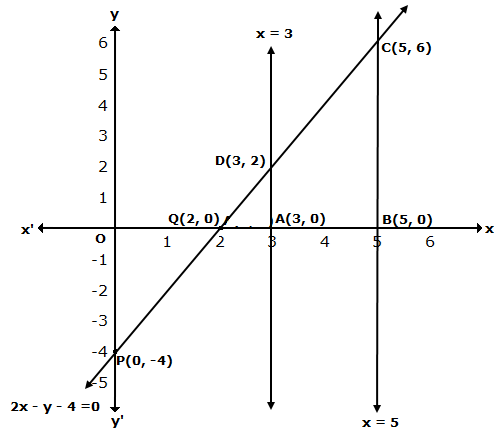 Write the vertices of the figure formed by these lines, the x-axis and the y-axis. Also, find the area of the figure. 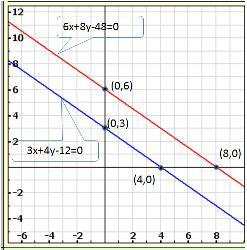 The graph of x = -2 is a straight line parallel to Y-axis at a distance of 2 units to the left of Y-axis. 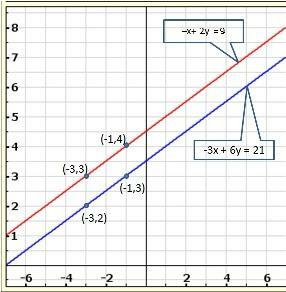 The graph of y = 3 is a straight line parallel to X-axis at a distance of 3 units above X-axis. 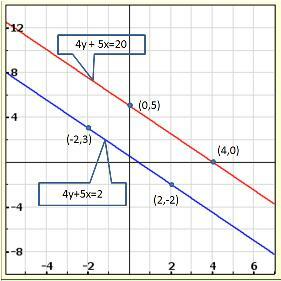 Draw the graphs of the pair of linear equations x - y + 2 = 0 and 4x - y - 4 = 0. 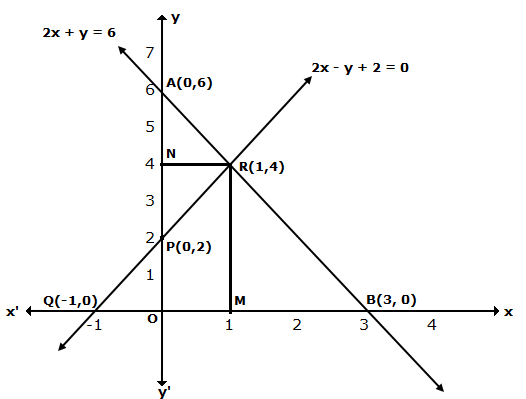 Calculate the area of the triangle formed by the lines so drawn and the x-axis. 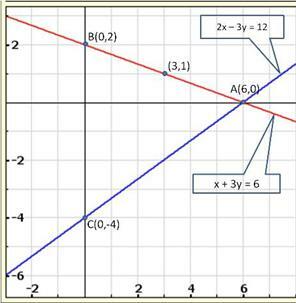 If x + 1 is a factor of 2x3 + ax2 + 2bx + 1, the find the values of a and b given that 2a - 3b = 4. 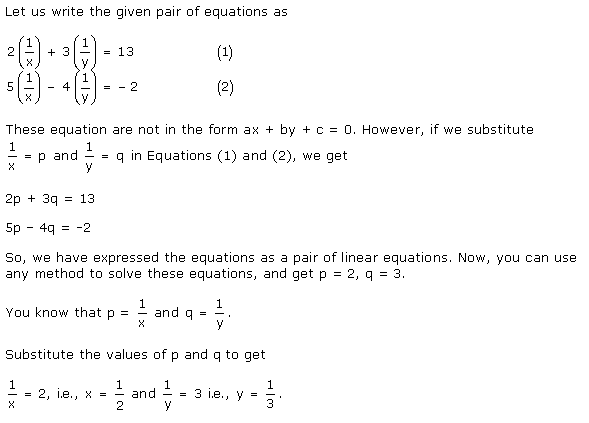 Find the solution of the pair of equations and . Hence, find λ, if y = λx + 5. 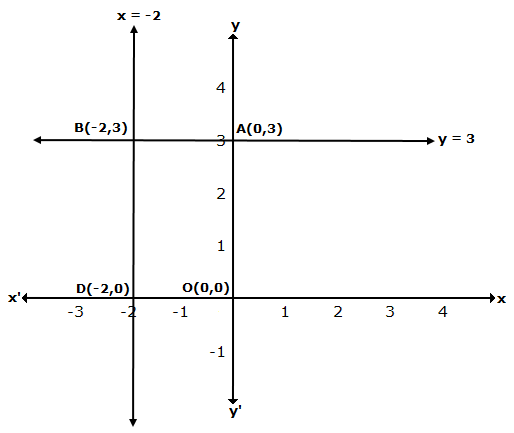 Find the values of x and y in the following rectangle. Write an equation of a line passing through the point representing solution of the pair of linear equations x + y = 2 and 2x - y = 1. How many such lines can we find? 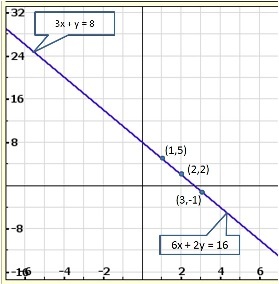 Write a pair of linear equations which has the unique solution x = -1, y = 3. How many such pairs can you write? 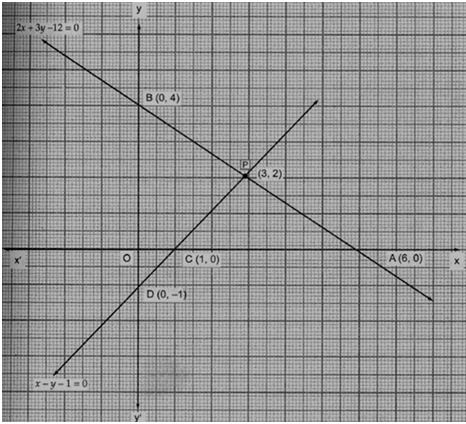 For what value of k, the following system of equations will represent the coincident lines? 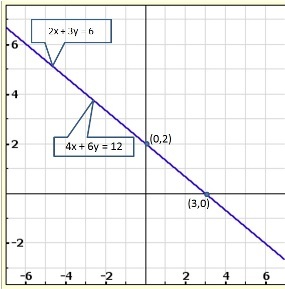 For which value(s) of λ, do the pair of linear equations λx + y = λ2 and x + λy = 1 have no solution? 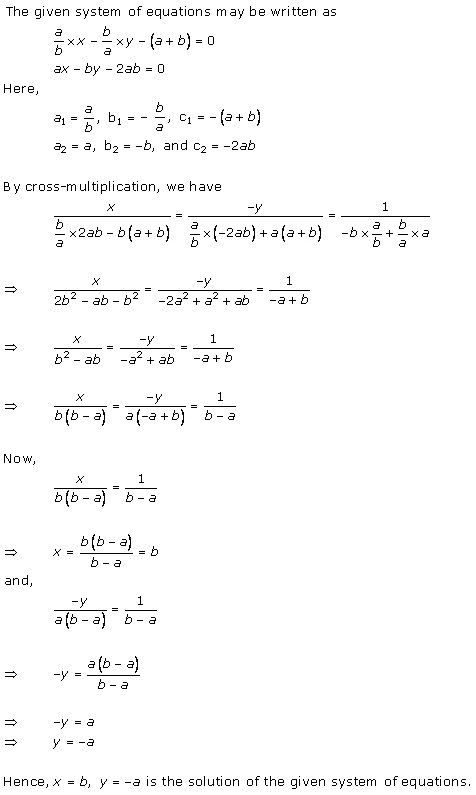 For which value(s) of λ, do the pair of linear equations λx + y = λ2 and x + λy = 1 have infinitely many solutions? 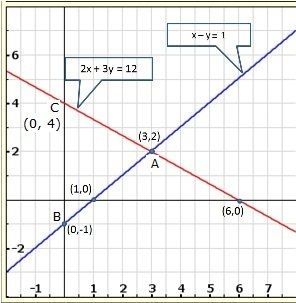 For which value(s) of λ, do the pair of linear equations λx + y = λ2 and x + λy = 1 have a unique solution? Jamila sold a table and a chair for Rs.1050, thereby making a profit of 10% on a table and 25% on the chair. If she had taken profit of 25% on the table and 10% on the chair she would have got Rs.1065. Find the cost price of each. Susan invested certain amount of money in two schemes A and B, which offer interest at the rate of 8% per annum and 9% per annum, respectively. She received Rs.1860 as annual interest. However, had she interchanged the amount of investment in the two schemes, she would have received Rs.20 more as annual interest. How much money did she invest in each scheme? The coach of a cricket team buys 7 bats and 6 balls for Rs 3800. Later, he buys 3 bats and 5 balls for Rs 1750. Find the cost of each bat and each ball. A lending library has a fixed charge for the first three days and an additional charge for each day thereafter. Saritha paid Rs. 27 for a book kept for seven days, while Susy paid Rs 21 for the book she kept for five days. Find the fixed charge and the charge for each extra day. The cost of 4 pens and 4 pencils boxes is Rs.100. Three times the cost of a pen is Rs.15 more than the cost of a pencil box. 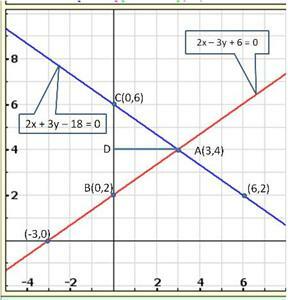 Form the pair of linear equations for the above situation. Find the cost of a pen and a pencil box. One says, "Give me a hundred, friend! I shall then become twice as rich as you". The other replies, "If you give me ten, I shall be six times as rich as you". Tell me what is the amount of their (respective) capital? A and B each have a certain number of mangoes. A says to B, "if you give 30 of your mangoes, I will have twice as many as left with you. "B replies, "if you give me 10, I will have thrice as many as left with you. "How many mangoes does each have? Vijay had some bananas, and he divided them into two lots A and B. He sold first lot at the rate of Rs.2 for 3 bananas and the second lot at the rate of Rs.1 per banana and got a total of Rs.400. If he had sold the first lot at the rate of Rs.1 per banana and the second lot at the rate of Rs.4 per five bananas, his total collection would have been Rs.460. Find the total number of bananas he had. The sum of two-digit number and the number formed by reversing the order of digits is 66. If the two digits differ by 2, find the number. How many such numbers are there? The sum of digits of a two-digit number is 9. Also, nine times this number is twice the number obtained by reversing the order of the digits. Find the number. Two numbers are in the ratio 5 : 6. If 8 is subtracted from each of the numbers, the ratio becomes 4 : 5. Find the numbers. 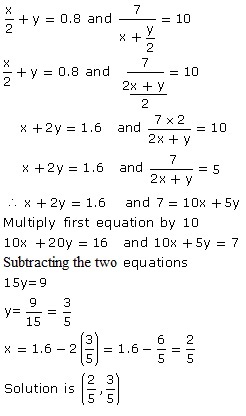 A fraction becomes 9/11 if 2 is added to both numerator and the denominator. If 3 is added to both the numerator and the denominator it becomes 5/6. Find the fraction. The sum of the numerator and denominator of a fraction is 12. If the denominator is increased by 3, the fraction becomes 1/2. Find the fraction. The present age of a father is three more than three times the age of the son. Three years hence father's age will be 10 years more than twice the age of the son. Determine their present ages. Two years ago, Salim was thrice as old as his daughter and six years later, he will be four years older than twice her age. How old are they now? The age of the father is twice the sum of the ages of his two children. After 20 years, his age will be equal to the sum of the ages of his children. Find the age of the father. The boat goes 30 km upstream and 44 km downstream in 10 hours. In 13 hours, it can go 40 km upstream and 55 km downstream. Determine the speed of stream and that of the boat in still water. A person rowing at the rate of 5 km/h in still water, takes thrice as much time in going 40 km upstream as in going 40 km downstream. Find the speed of stream. Ritu can row downstream 20 km in 2 hours, and upstream 4 km in 2 hours. Find her speed of rowing in still water and the speed of the current. A motor boat can travel 30 km upstream and 28 km downstream in 7 hours. It can travel 21 km upstream and return in 5 hours. Find the speed of the boat in still water and the speed of the stream. be solved easily by elimination method. Places A and B are 100 km apart on a highway. One car starts from A and another from B at the same time. If the cars travel in the same direction at different speeds, they meet in 5 hours. If they travel towards each other, they meet in 1 hours. What are the speeds of two cars? ABCD is a cyclic quadrilateral such that A = (4y + 20)o, B = (3y - 5)o, C = (-4x)o and D = (7x + 5)o. Find the four angles. Concept insight: The most important idea to solve this problem is by using the fact that the sum of the measures of opposite angles in a cyclic quadrilateral is 180o. 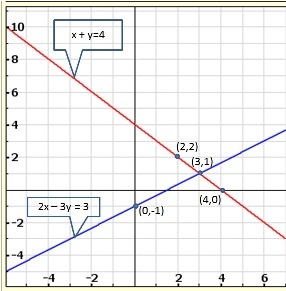 By using this relation, two linear equations can be obtained which can be solved easily by eliminating a suitable variable. The car hire charges in a city comprise of fixed charges together with the charge for the distance covered. For a journey of 12 km, the charge paid is Rs 89 and for a journey of 20 km, the charge paid is Rs. 145. What will a person have to pay for travelling a distance of 30 km? A part of monthly hostel charges in a college are fixed and the remaining depends on the number of days one has taken food in the mess. When a student A takes food for 20 days, he has to pay Rs 1000 as hostel charges whereas a student B, who takes food for 26 days, pays Rs 1180 as hostel charges. Find the fixed charge and the cost of food per day. 2 Women and 5 men can together finish a piece of embroidery in 4 days, while 3 women and 6 men can finish it in 3 days. Find the time taken by 1 woman alone to finish the embroideery, and that taken by 1 man alone. Meena went to a bank to withdraw Rs 2000. She asked the cashier to give her Rs 50 and Rs 100 notes only. Meena got 25 notes in all. Find how many notes Rs 50 and Rs 100 she received. The students of a class are made to stand in rows. If 3 students are extra in a row, there would be 1 row less. If 3 students are less in a row there would be 2 rows more. Find number of students in the class. A shopkeeper sells a saree at 8% profit and a sweater at 10% discount, thereby getting a sum of Rs.1008. If she had sold the saree at 10% profit and sweater at 8% discount, she would have got Rs.1028. Find the cost price of the saree and the list price (price before discount) of the sweater. In a competitive examination, one mark is awarded for each correct answer while ½ mark is deducted for every wrong answer. Jayanti answered 120 questions and got 90 marks. How many questions did she answer correctly? A shopkeeper gives book on rent for reading. She takes a fixed charge for the first two days, and an additional charge for each day thereafter. Latika paid Rs.22 for a book kept for 6 days, while Rs.16 for the book kept for four days. Find the fixed charges and charge for each extraday. 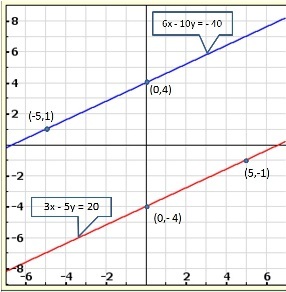 Consistent solution means either linear equations have unique solutions or infinite solutions. 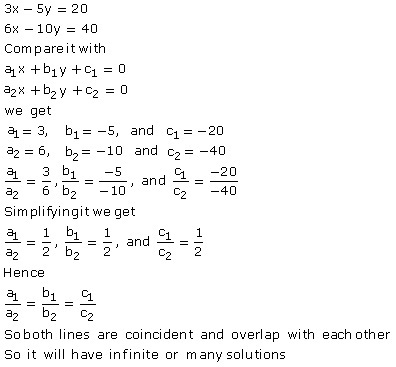 ⇒ If solutions are infinite, lines are coincident. 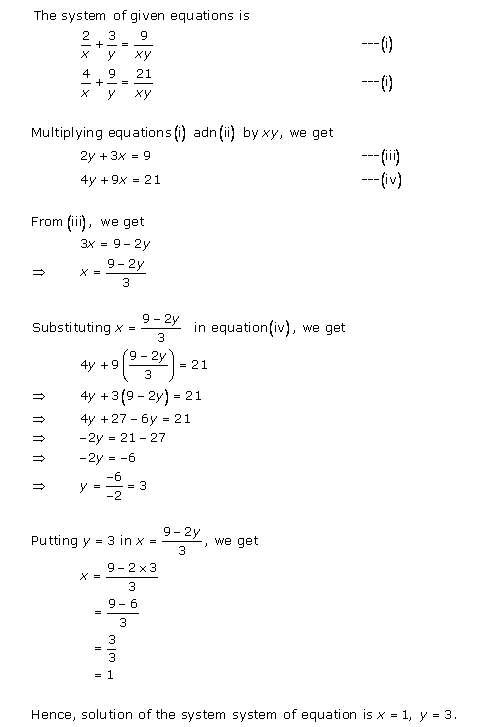 For what value k, do the equations 3x - y + 8 = 0 and 6x - ky + 16 = 0 represent coincident lines?